What is the definition of the term "running bad" in poker? 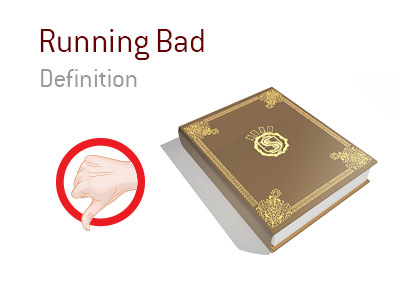 What does the term "running bad" mean? In poker, "running bad" refers to when you are getting dealt strong hands and involving yourself in situations where you are the favorite to win, though you still end up losing the hands. Or, to put it simply, you are just going through a run of bad luck at the table. For instance, let's say that you get dealt pocket Aces three times in a row. In all three cases, you and your opponent go all-in pre-flop, and in all three cases, you have your opponent crushed. In the first hand, your opponent spikes a King on the flop and wins with a set. In the second hand, your opponent rivers a Broadway straight. In the third hand, your opponent wins with a flush. This is a great example of "running bad", as you were the clear favorite to win all three hands, though you ended up losing all three. "Running good", on the other hand, refers to when you are getting yourself involved in situations where you are not the favorite to win, though you still end up winning.